﻿ Gulf South Forest Products, Inc. » Blog Archive Lauderdale Lumber Firm Earns U.S. 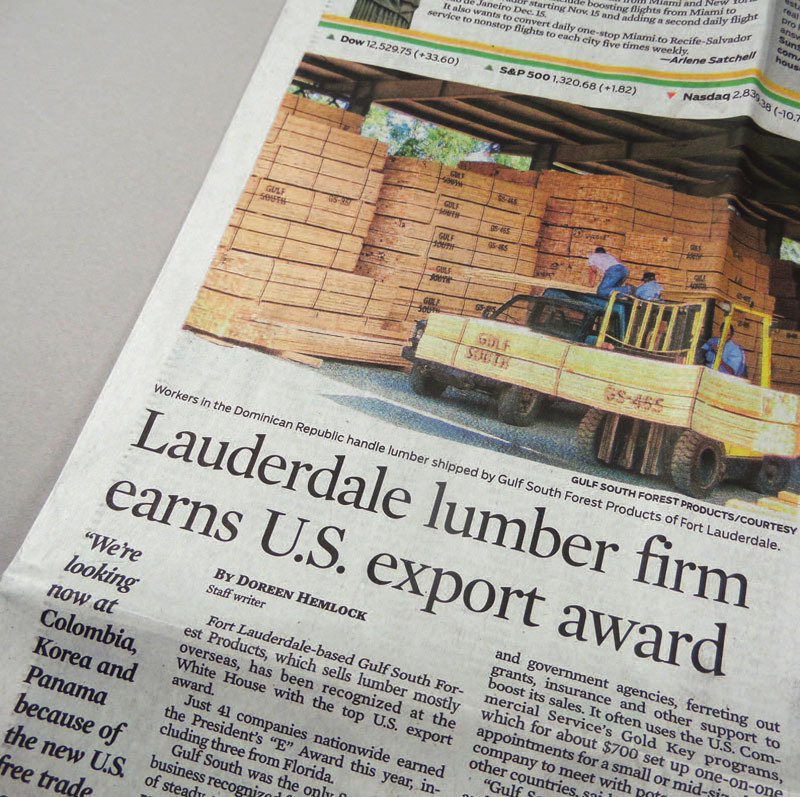 Export Award | Gulf South Forest Products, Inc.
Fort Lauderdale-based Gulf South Forest Products, which sells lumber mostly overseas, has been recognized at the White House with the top U.S. export award. Just 41 companies nationwide earned the President’s “E” Award this year, including three from South Florida. Gulf South was the only South Florida business recognized for four straight years of steady export growth. Its sales abroad rose an average of 20 percent yearly from 2008 to 2012, officials said. “It’s truly a great accomplishment,” said Kathryn Dye-Gresh, a senior trade specialist and the U.S. Export Assistance Center in Fort Lauderdale, who has helped counsel the family-owned business. ships “so it could get into smaller ports and have more flexible shipping times,” Dye-Gresh said. Gulf South also effectively leverages resources available from industry groups and government agencies, ferreting out grants, insurance and other support to boost its sales. It often uses the U.S. Commercial Service’s Gold Key programs, which for about $700 set up and one-on-one appointments for a small or mid-sized U.S. company to meet with potential buyers in other countries, said Dye-Gresh. “Gulf South really does their research and their follow-up,” said Dye-Gresh. “That makes them successful for the long run.” Started 25 years ago, Gulf South sells lumber, plywood, electric poles and other wood products in 23 countries. Roughly 95 percent of sales are exports to nations as varied as China, Haiti, Dominican Republic and Ghana. Revenue topped $50 million last year, said founder and chief executive Sam Yohanan. The business runs lean, with just 11 employees – including many long-timers who take pride in decades-old relationships with their overseas customers. Stevedores, ships and other basics are contracted as needed. And the Yohanan family and their team methodically look to open new markets and keep growing. Longer term, the company also sees opportunity for multimillion-dollar sales yearly in Cuba. It already has sold some wood to the island, since lumber is considered a farm product and can be sold with government licenses under an exemption to the U.S. embargo on Cuba, Yohanan said. Companies are nominated for the “E” Award through the U.S. Commercial Service network in 108 U.S. cities and more than 75 countries. A committee of officials from the Commerce Department and other government agencies selects the winners. The President’s “E” Award was created by President John F. Kennedy in 1961 to promote U.S. exports. President Barack Obama set a goal in 2010 of doubling U.S. exports over five years.